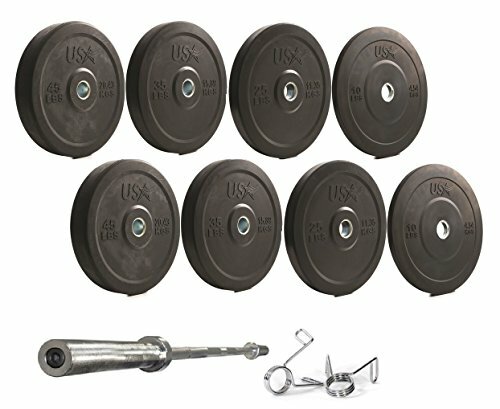 The new USA Sports black, Solid Rubber Bumper plate with solid steel insert is a quality, branded bumper plate, engineered to Troy Barbell's USA line standards. The GBO-SBP black bumper plate features both lbs. and KG markings on both sides. These new bumpers feature minimal amount of conditioner. The new USA black bumper plate is the perfect addition to any home gym. The GOB-86 7' chrome Olympic bar is the one we include in all our weight sets and is a staple of retail dealers nationwide. A larger 31mm stress-proof steel bar shaft makes it stronger than most other bars in its class and a great addition to any home workout. Estimated max weight capacity of 600lbs. Troy Barbell Bumper Plate Set includes pairs of: 45lb, 35lbs, 25lbs, & 10lb bumpers, 1 GOB-86 and 1 pair of TOZC Spring Collars. Perfect addition for any garage gym. All bumper plates include steel insert.